Cat-scratch disease, first described in 1931, has received little notoriety in the head and neck literature, despite the fact that 50% of patients present with cervical lymphadeno-pathy. The most extensive reports are noted in the pediatric literature, where it accounts for a sizable proportion of unilateral lymphadenopathy in children and adolescents (5). Definition. Cat-scratch disease has been alternatively termed cat-scratch fever, benign lymphoreticulosis, or nonbacterial lymphadenitis. The cardinal feature of the disease is a subacute regional granulomatous lymphadenitis that follows a relatively mild clinical course. The etiologic agent is a pleomorphic gram-negative bacillus. Epidemiology. Cat-scratch disease has a worldwide distribution, without gender or racial predilection. It is primarily a disease of children and adolescents, although nearly 25% of patients with the disease are over 30 years of age. Pathogenesis. The causative bacillus is transmitted by direct contact from a cat scratch, bite, or lick. A history of exposure to a cat with identification of a primary inoculation site is obtained in the majority of patients affected. Clinical Manifestations. The primary lesion develops as an erythematous, nonpruritic pustule 7 to 12 days following the inoculation. Lymphadenitis generally develops two to four weeks following inoculation and is located proximal to the inoculation site. The three most common regions affected by lymphadenitis include the axillary, cervical, and inguinal areas. Cervical adenitis, occurring in nearly 50% of patients, is typically noted in the upper cervical, submandibular, and nodal basins (Fig. 4). Most commonly, a single nodal basin will be involved, although multiple nodes within the group will be enlarged. Suppuration with acute tenderness, accompanied by fever, may occur in up to 30% of patients. Nodal enlargement generally resolves over two to three weeks but may persist for up to two years. Most patients will experience mild constitutional symptoms such as malaise, headache, and fever. Atypical clinical manifestations occur in approximately 5% of patients, the most common of which is Parinaud's oculoglandular syndrome (6). This constellation of findings consists of granulomatous conjunctivitis with preauricular adenitis. 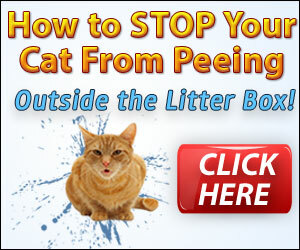 The primary lesion occurs after rubbing the eye after holding a cat. The remaining atypical presentations are very rare, accounting for about 1% to 2% of all cases. These include central nervous system (CNS) involvement with encephalitis, myelitis, and radiculopathy. Encephalitis in children may induce seizure or coma. 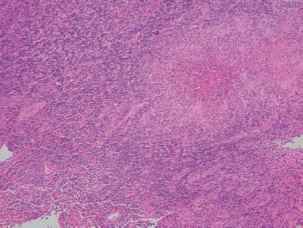 Other rare manifestations encountered include thrombocytopenic purpura, osteomyelitis, and hepatosplenomegaly. FIGURE 4 Patient with cervical lymphadenopathy secondary to cat-scratch disease. Source: Photo courtesy of Dr. Edward Wood. 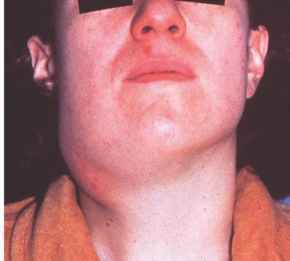 of cervical lymphadenopathy should be excluded. The differential diagnosis should include nonspecific bacterial adenitis, lymphogranuloma venereum, mycobacterial infection, mononucleosis, tularemia, syphilis, toxoplasmosis, fungal disease, and neoplasms of the lymphoreticular system. Treatment. 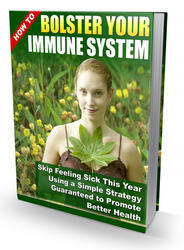 Therapy is supportive, without any known specific antimicrobial treatment of benefit. Analgesics and warm compresses, especially for suppuration, appear to offer the most relief. Needle aspiration of suppurative nodes is helpful. Nodal excision is usually not necessary and potentially results in a draining sinus tract. Complications and Prognosis. Complications resulting from cat-scratch disease are rare. The disorder most commonly follows a benign and self-limited course with near-universal recovery. Severe disease may result in significant suppuration of nodal groups that may require surgical drainage and debridement. Cat-scratch disease is discussed in further detail in Chapter 11. 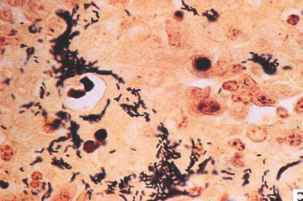 FIGURE 5 Gram-negative coccobacilli demonstrated by Warthin-Starry stain in needle aspirate from lymph node affected by cat-scratch disease. Source: Photo courtesy of Dr. Edward Wood. FIGURE 6 Histologic section from aspirate obtained from lymph node affected by cat-scratch disease. Source: Photo courtesy of Dr. Robert Brown.